Super cool Disco keyboard loops in MIDI format. If you want those proper chords and riffs like they used to do it back in the late 70s and early 80s then look no further. This brand new collection from Smash Up The Studio features authentic keyboard work in classic Disco styles. 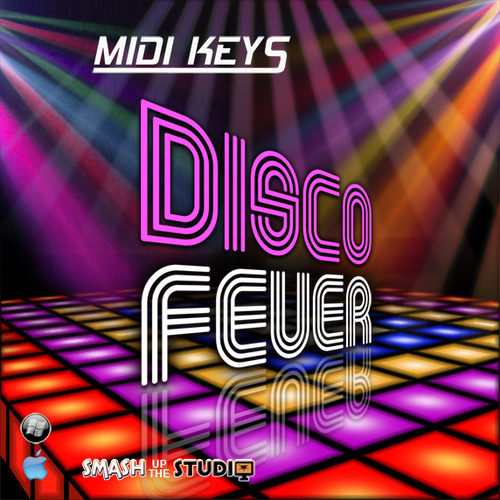 Smash Up The Studio presents MIDI Keys: Disco Fever a timeless collection of keyboard loops for producers who need to capture the classic feel of the old school in their tracks. Featuring 70 professionally performed MIDI loops for Horns, Strings, Piano, Bass, Rhodes, Synths, Guitar and Clavinet. Each kit is broken down into separate loops so the user can build and arrange the track to their own requirements. All loops are tempo labelled although with MIDI files the editing capabilities are endless. Just choose your coolest sounds and off you go!